Mama Fireplant is a large, talking Piranha Plant and a character from the Super Mario World episode "Fire Sale". Mama Fireplant lives on the outskirts of Dome City in a dome-house across the river. Unlike most Piranha Plants, Mama Fireplant is actually nice, aiding the nearby inhabitants of Dome City by using her fireballs to give them heat. During "Fire Sale", Mama Fireplant was kidnapped by Kootie Pie Koopa and her Koopa Troopa henchman; Kootie Pie had planned on using Mama Fireplant to heat-up her palace in Ice Land, Kootie Pie also planned on making a fortune selling-off Mama Fireplant's fireballs to the cavepeople, without even knowing that she will eventually die in Ice Land's frigid climate. She also has a song to sing during the episode called Kootie Pie Rap. Yoshi, Mario, Luigi and Princess Toadstool managed to track Mama Fireplant to Kootie Pie's rapidly melting palace. After some trouble involving Porcupine Fish, it was Yoshi who saved Mama Fireplant, using her pot as a sled to slide out of Kootie Pie's palace. Mama Fireplant was returned to her home in Dome City, where she proceeded to throw a barbecue party in Yoshi's honor. 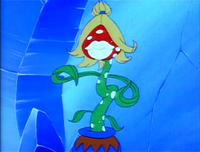 She is the only known Piranha Plant with hair other than Piranha Sue. This page was last edited on October 2, 2018, at 00:17.